Irma Garcia, an art teacher at Pioneer High School, offers art intervention assignment that serves as an outlet for student expression what they may be dealing with. 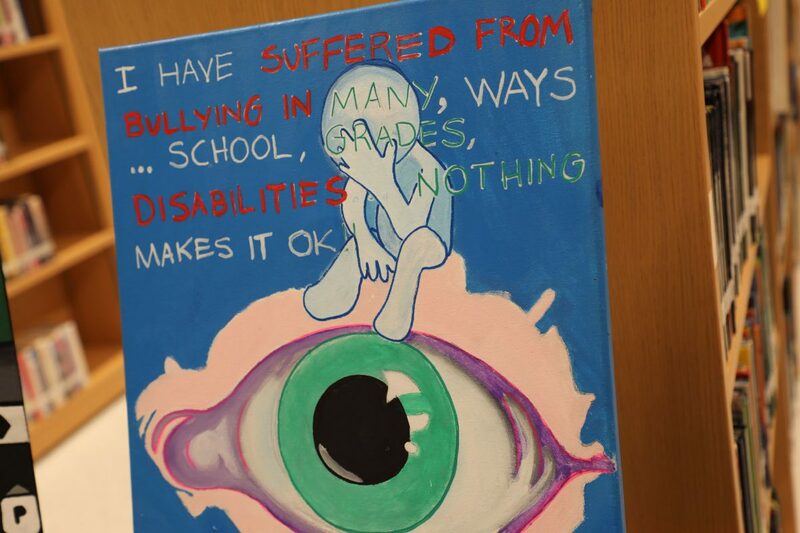 MISSION — Inside the Pioneer High School library bedecked with student artwork representing self-harm, depression and suicide, a junior student spoke about his bullying experiences before an audience of teachers, coaches and staff. The event was part of Sharyland ISD’s district-wide campaign, “Choose Kind,” to combat bullying to foster a harassment-free environment on its campuses. Since David’s Law — legislation to help combat and prevent bullying in schools — went into effect last September, schools throughout the state of Texas have stepped up to send the message that bullying, whether on campus or online, will not be tolerated. Pioneer Dean of Instruction Belinda Garcia said several instances of bullying within the student body have occurred, namely online, and with David’s Law now in place, the school has the right and obligation to take action. Monthly staff developments have implemented training on how to handle cases of bullying and take notice of certain behaviors. The junior student, whose name is being withheld in order to avoid the potential of being ostracized or mocked by his peers, was invited to speak during the meeting by his art teacher Irma Garcia. He shared how subtle forms of bullying often hurt more. As one of the only male belles on the dance team, insensitive remarks for his passion, he said, have left lingering pain. Irma Garcia has been with the district for 19 years and offers an art intervention assignment that serves as an outlet for student expression what they may be dealing with. The paintings in the library showcased her students’ work. Often, she said, the pieces submitted surprise her, revealing personal struggles typically masked by cheery demeanor. Before sharing his experiences, the junior student performed an original dance dedicated to the victims of a hate crime. Since “Choose Kind,” was launched, he said he has noticed an observable change in attitude from both teachers and students. “When someone gets reminded to be kind it always sparks (kindness) in you,” he said. After the presentation, the staff was invited to examine the art pieces created by the students from their classrooms.